The book takes a nostalgic look at life in war-time Matlock and Matlock Bath, and was researched at our very own Local Studies Library, and using original archives from Derbyshire Record Office. 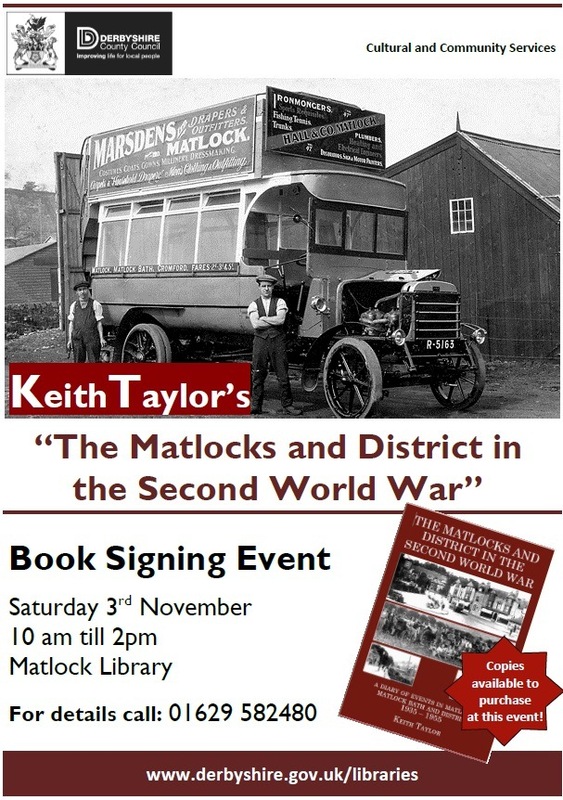 Keith will be signing copies of his new book at Matlock Library this weekend, Sat 3rd Nov, 10am-2pm. 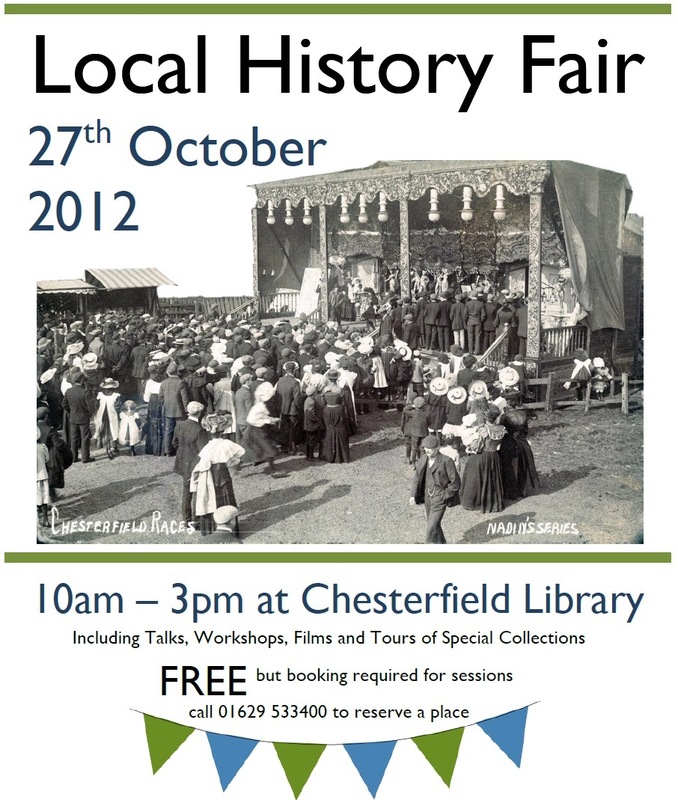 Calling all local history enthusiasts… this Saturday we will be holding a fantastic local history day at Chesterfield Library. 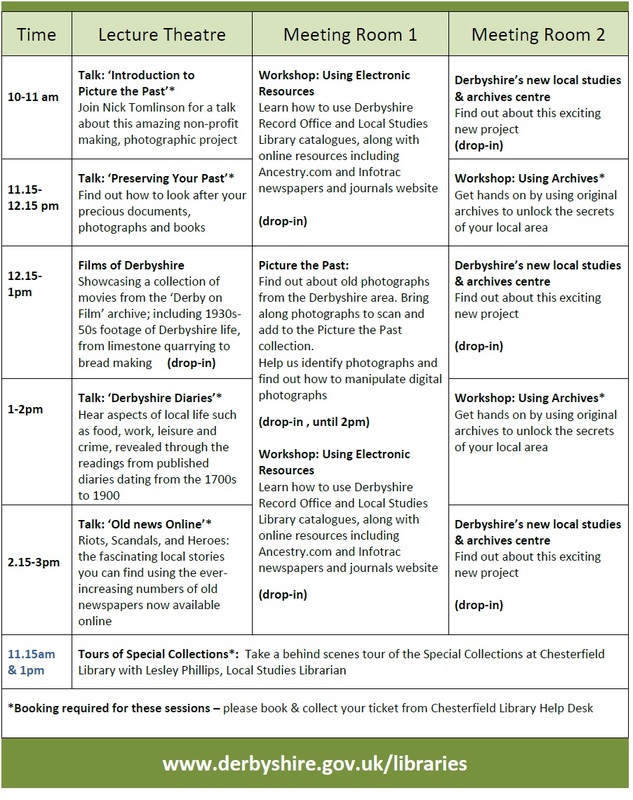 The event includes talks, workshops, old films of Derbyshire, and the chance to find out about our new local studies and archive centre. The event is FREE, but booking is required for some sessions – please call 01629 533400 for more information, or to book a place… don’t miss out!! 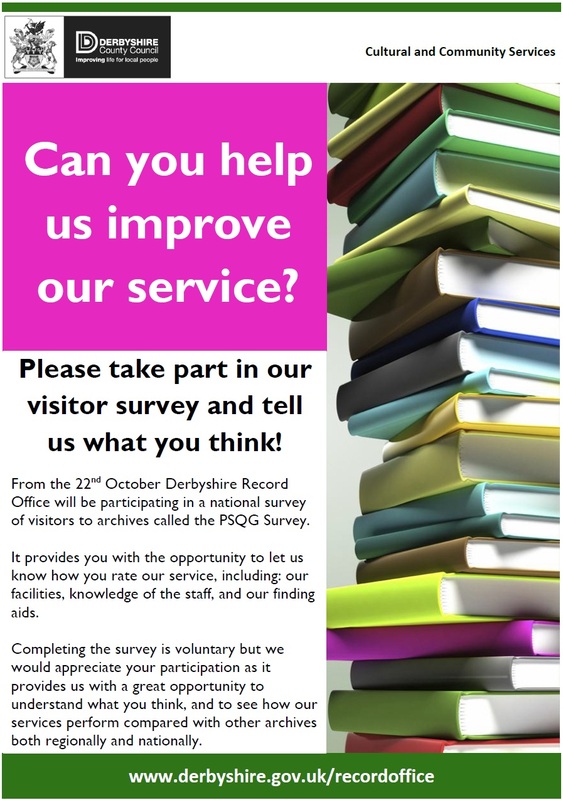 This Autumn the Record Office will be taking part in the Derwent Valley Mills World Heritage Site ‘Discovery Days’. 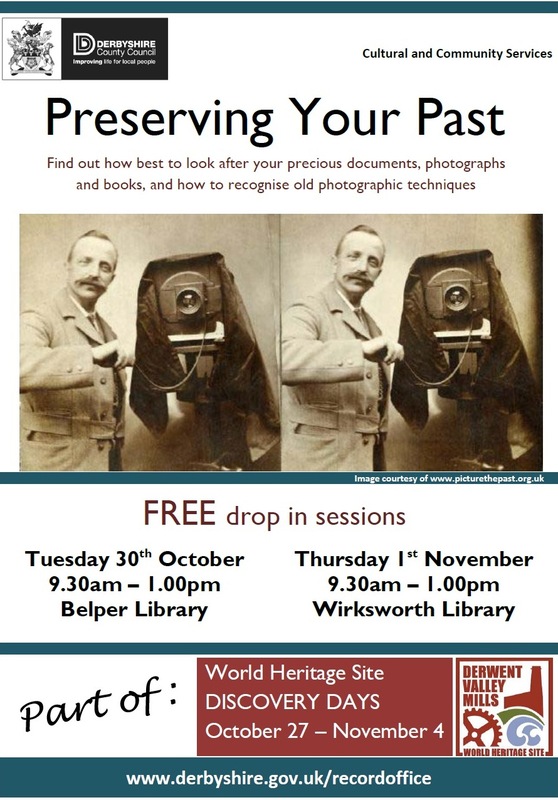 Tuesday 30th Oct at Belper Library and Thursday 1st November at Wirksworth Library. All welcome – no need to book – just come along, 9.30am-1.00pm, and find out about how to care for your own precious documents and photographs at home, and how to recognise old photographic techniques. Bring along your own documents and photographs for individual advice. Chesterfield was on Saturday night, for the first time, illuminated by the electric light. The experimental operations proved very successful; and as the Corporation are hopelessly in conflict with the local gas company, it is probable that the electric light will be a permanent institution in Chesterfield. SINGULAR DEATH – John Shaw, the landlord of the New Inn, Greenhill lane, Alfreton, some three weeks ago was attempting to catch a wasp which was in the window of his house, when he stumbled and cut his wrist on a broken pane of glass. He bled very much at the time, and from blood poisoning and the shock to his system he died on Wednesday. It is not deemed necessary to hold an inquest. The County Local Studies Library holds the Derby Mercury – just ring to book a microfilm reader. If you have a Derbyshire library card you can also view 19th century issues of the newspaper online. The death is announced from New York of Mrs. Mary Monroe, on the 15th September, in her 98th year. Born in Derbyshire, England, February 1, 1795, she early in life developed a passion for travel, and was counted at the time of her death the most travelled woman in America. In 1830 she passed Easter week in the city of Rome as a guest of the Pope. She was a friend of Lafayette, and was twice a guest of Sir Walter Scott, and she counted among her friends the Duchess of Kent. When 70 years of age she travelled for 20 weeks alone, visiting every part of Great Britain and Ireland in order to investigate the condition of the working classes. Her husband was an officer of the Customs service of the United States. The County Local Studies Library holds the Derby Mercury – just ring to book a microfilm reader. If you have a Derbyshire library card you can also view 19th century issues of the newspaper online at the libraries area of the council website. Are you starting to think about making your mincemeat?